Helmets come in plenty of shapes, sizes, colors and then some. Obviously, your best choice is a full-face helmet. Despite calls from some freedom riders that full face impairs their vision, there's no proven analysis. But regardless of the helmet you choose to wear, here's the lowdown on how to care, clean, and protect your investment. We say investment, because you can choose a $100 brain bucket, or a $1,000 one. The more you pay, the more life you'll want out of it, no doubt. Since the eyes are the most important transporter of information to your brain, having a clean face shield is critical to making sound decisions based on what you see. If your vision is impaired due to scratches on the surface, a fogged anti-fog insert (yes - this happens and it's no fun), or the incorrect tint for the riding conditions, a lot can go wrong. Always use a clear face shield - Forget about tinted face shields. You can wind up in the wrong conditions for the face shield you selected earlier in the day and not be able to see well. Instead, choose eyewear with interchangeable lenses and work with them throughout the day to utilize the lens that's best for the current conditions. 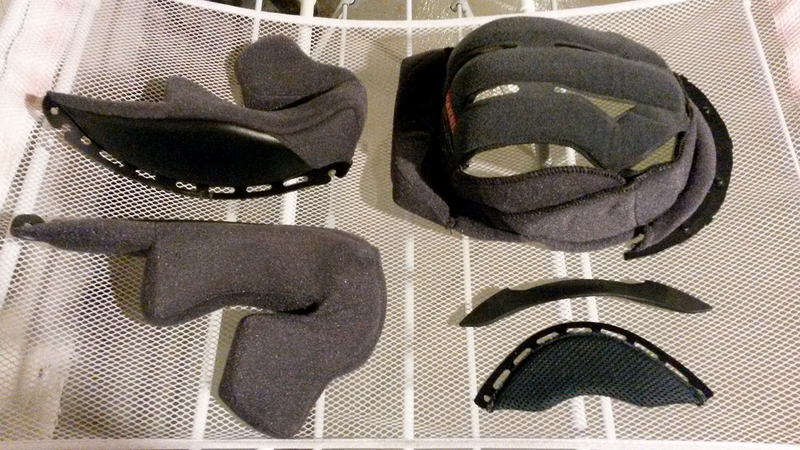 As for packing multiple interchangeable face shields - forget it - it's a hassle. If you wear prescriptions, look for larger eyewear that fits over your prescription glasses. It's out there. Keep it clean - It's not just about how often you clean it, but what you use to clean it. Your best choice is a microfiber cloth and a cleaning solution like Novus 1 plastic cleaner that's safe for plastic. Apply the solution to the cloth, not the face shield, and buff clean. Use a dry area of the cloth to dry excess fluid. Never use a paper towel on a plastic face shield or you risk burnishing in micro-scratches which will permanently erode the visual clarity. Never use a scruffy squeegee at the gas station which is even more destructive. Stay away from harsh chemicals - Believe it or not, a microfiber cloth saturated with just water will often be all you need to clean a face shield. Using harsher products like dish washing liquid, alcohol, and the original glass version of Rain X will lead to deterioration of the laminates and eventual breakdown in the clarity of the face shield. Replace as necessary - When you notice the visual clarity of the face shield is getting fuzzy (this is most obvious when riding into the sun), it's time to pony up and buy a replacement. Skip the light-adjusting lenses - Most face shields have a UV400 coating. This will not allow light-adjusting lenses to work effectively. Scratch removal - To remove scratches from the exterior shell, use a polish designed for the purpose. Both 3M and Novus make graduated products so if a scratch is really gnarly you can start with one level and finish with a finer grade. Novus 2 is handy for light scratches, but a deeper one may require Novus 3, then finishing off the cleaning with Novus 2. Applying stickers - if you plan to add some stickers to your helmet, be sure to clean the shell and buff with a light microcloth saturated with a little alcohol. Wax it - Feel free to wax the exterior shell to give it an extra level of sparkle. Your head will carry all sorts of dirt into the interior of your helmet. If you're not cleaning your liner every season you ride, you should look at the biological nightmare you own under a microscope for inspiration to clean. Now and then liners need to be cleaned. If it looks grimy or is stinky, the time has come. There are several ways to do this. Remove the liner and machine wash it - Higher-grade helmets often have a removable liner. Take it out, place it in a medium-sized mesh laundry sack and run it through the washer. Since many hold their shape, you're best off letting it air dry, rather than running it through the dryer. Take it in the shower - No removable liner? Pick a warm sunny day and take it into the shower with you, gently applying your favorite shampoo to the interior and washing it by hand. When done, gently press a towel into it a few times and place it in a warm place to dry. Up your cleaner - Switching from a detergent soap to a non-detergent cleaner like Nikwax or Dr. Bronner's will allow the fabric to be cleaned and do a far better job wicking future moisture, rather than retaining it in the pores. Dealing with tough grime - For some, tough grime will be present on the liner. This is yet another reason why god created old tooth brushes. Before running the liner through the washer or taking it into the shower, use an old tooth brush together with a cleaning solution of soap and water and lightly scrub away any thick grime. Grime in here is a common by-product for riders who routinely wear sun screen. Gary Meeker is a motojounalist living in North Seattle. When he's not riding or washing his helmet, he's working on his upcoming motorcycle novella, The Day Ride.